Shape matching! 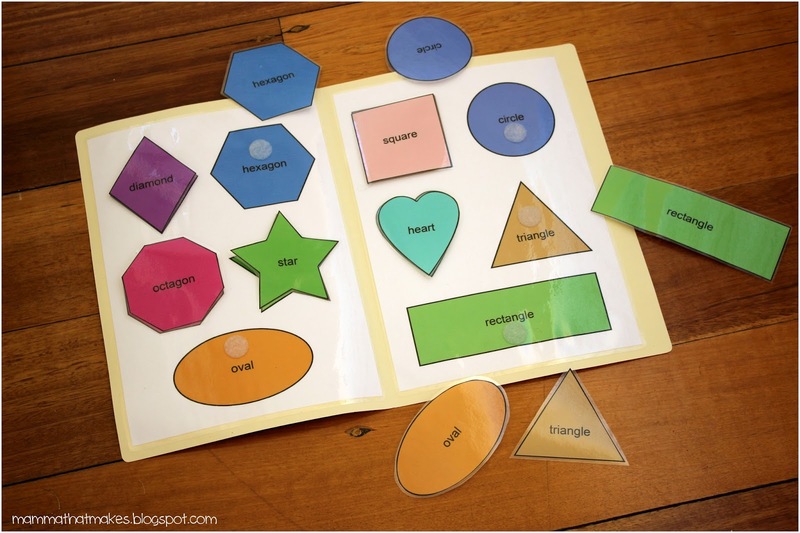 This game goes beyond the basic square, circle, triangle, and introduces preschoolers to a larger range of shapes. Now, I'm not expecting a toddler to understand the difference between a hexagon and an octagon straight up, but there is no harm in exposing them to these shapes and words from the get go. 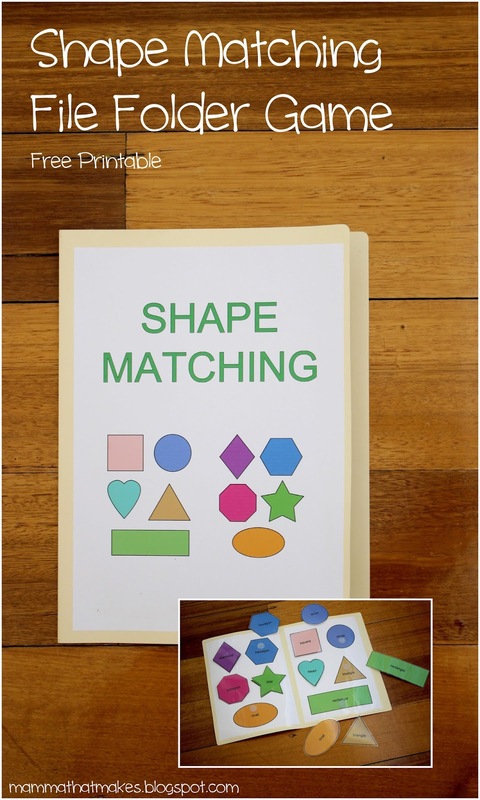 For younger kids it will be a simple matching game, and learning to recognise the shapes, their names, and also colours (eg, What colour is the star?, Which shape is green?) For older kids you can talk about the shapes some more, for example, how many sides they have or what other things in life resemble the shapes. New to file folder games? It's super simple to do! You'll need to download the free files here from my Google drive. There are both JPEG and PDF files, so whichever suits your needs. There is also a cover image for your file folder, if you don't want to make one yourself. Print out each set twice. Take one copy of each set and laminate the entire sheet. If you don't have a laminate machine you can use clear contact, or if you like you can leave the sheets as is. I laminate everything, so it can be used over and over. Stick these 2 laminated sheets into the inside of your file folder. I used double sided tape to attach them as I find it sticks better. Take the second copy of each set and cut the shapes out. 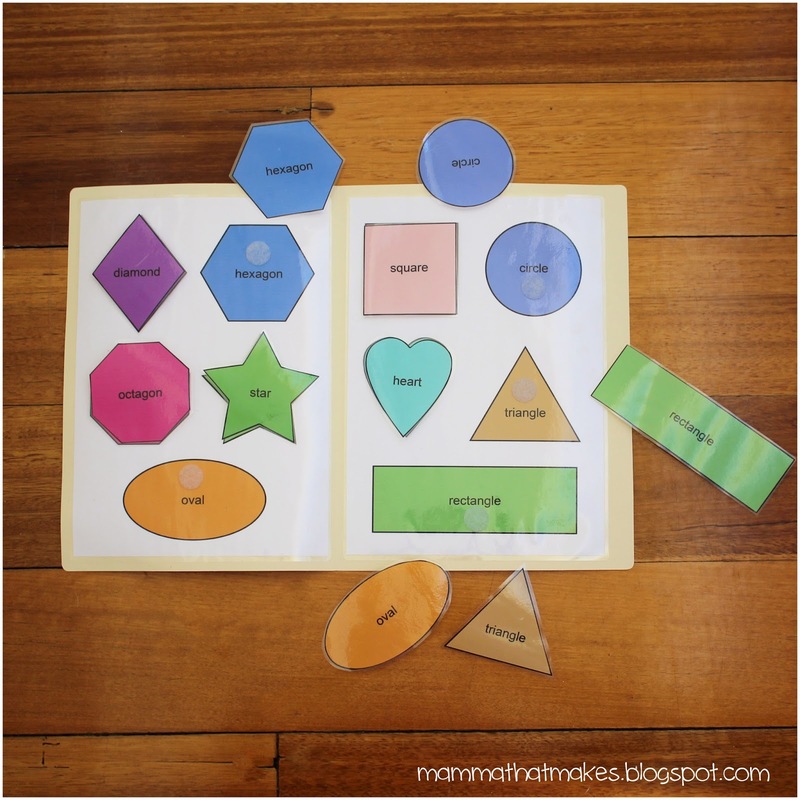 Laminate the shapes, and cut them from the laminate sheet. Here comes the fun part.. Velcro dots! I know I've talked about these before, but honestly, the VERY best way of attaching Velcro to laminate is by using the self adhesive sticky Velcro dots! Easy! Place one dot on the back of the shape, and the other on the shape it matches on the folder. That's it! Your done! If you are not using laminate or contact to cover your pieces, then I strongly recommend that you also avoid the Velcro. The pieces will rip when being removed if you have Velcro on them, so just sliding them into place would work fine. If this is the option you use, you can store the pieces in an envelope, and stick the envelope to the back of the folder, so pieces don't go missing. Put the cover on the folder. Again, I used double sided tape. Boy I love that stuff! That's it lovelies, you are done! Now let your toddler/preschooler have some fun with it! Looking for more preschool printable games? Check them out here.